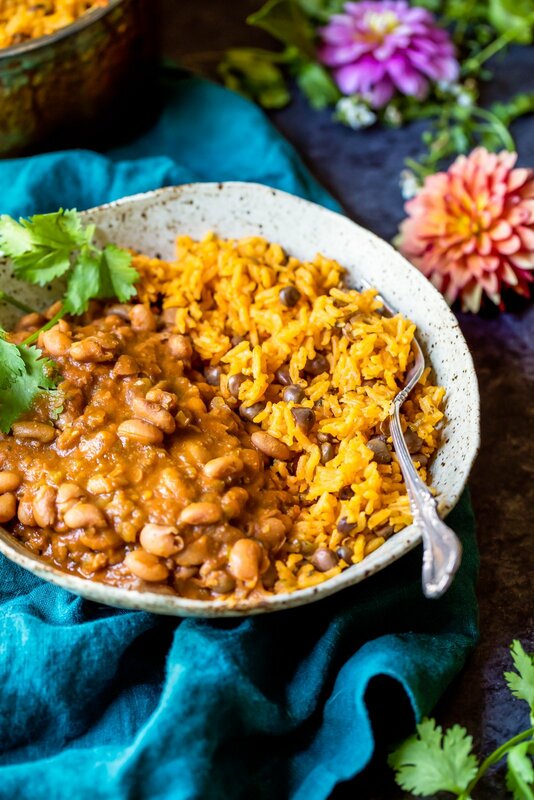 Mom’s authentic Puerto Rican Rice and Beans with savory homemade sofrito and sazon! You’ll love this incredibly flavorful, comforting homemade meal that will fill your home with unbelievably delicious smells. The perfect recipe to serve a crowd or just savor leftovers for a few days! OHHHH hi! I’ve been teasing this beautiful recipe for a while now on Instagram stories and I couldn’t be more excited to finally share one of my favorite comfort foods in the entire world: my mom’s Puerto Rican Rice and Beans. As many of you know, my mom is full Puerto Rican, as are my grandparents. My childhood dinner’s were often full of hispanic cuisine — often empanadas, rice and beans, tostones, pazole and ALL THE GOOD THINGS IN LIFE. More recently, I’ve connected with recipes that are from my heritage and started cooking from the soul again. Personally, it feels incredibly rewarding when Puerto Rican soul food fills my home with it’s intoxicating, aromatic spices. And even if you aren’t Puerto Rican, why not try something new?! We could all use a good dose of global inspired creativity and cooking in our lives. These rice and beans are the perfect way to start. By the way, as an ode to my heritage and strong connection with food, Tony and I decided to have a custom hispanic themed menu (with many authentic Puerto Rican flavors) thanks to Fig Catering. We’ve had nothing but incredible experience with Fig, so if you’re based in the Chicago area and need a caterer — check them out. Now let’s talk about this recipe and all the details because I’m SO excited for you to try it all out ASAP. Before you begin, please know that you may need a few ‘special’ ingredients that can be a little difficult, depending on where you live. DRIED PINK OR PINTO BEANS: You’ll need dried pinto or pink beans (my mom loves pink and I love pinto), the choice is yours. I had a really hard time finding them (even in Chicago), but if your store has a hispanic section, you might be in luck. SAZON: Sazon is a really popular Puerto Rican spice. The downside of most sazon is that it contains MSG, so I’ve included a homemade DIY sazon in the notes section of the recipe. I still use the packets because they are easy for me to find and the flavors are 100% similar to what I’m used to. It’s really up to your personal preference but there is also one on Amazon without MSG here. ALSO sazon seasoning is literally my favorite thing EVER. GREEN PIGEON PEAS: Green pigeon peas are INCREDIBLE and very, very good for you. Unfortunately they are difficult to find. I use the Goya brand and have to purchase in the hispanic section (if they have it), head to our local hispanic store, or purchase off Amazon. Don’t worry though — if you want to use frozen peas instead that’s totally an option and I’ve included how to use them in the recipe notes section below. WHITE BASMATI RICE: This is our favorite kind to use because of how fluffy the rice gets. It shouldn’t be that difficult to find, but please don’t try and sub another rice. Or if you do, just know that cooking times differ. For instance, brown rice can take up to 45 minutes. Finally I wanted to share that this is a WONDERFUL recipe for serving a crowd, because you can easily double the recipe. And if you really want to add meat to this dish, I would suggest sauteed kielbasa sausage added to the beans. Perfect for dipping tortilla chips in too! 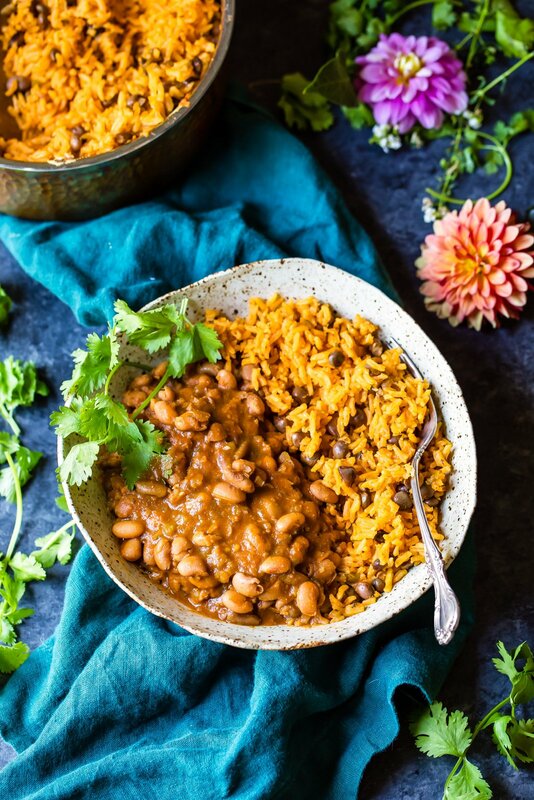 Everyone’s version of their own rice and beans are different, but this is what my mom and Grandma taught me and what I’m passing along to you. Technically this rice is called Arroz con Gandules, a signature rice dish in Puerto Rico (some add olives and pork, but not us). It’s how we usually make our rice and LOVE it so so much. I hope you LOVE this meal and enjoy with family and friends! If you make this recipe be sure and tag #ambitiouskitchen on Instagram or leave a comment below and rate it so I can know how you liked it. Thanks for being here — have a lovely week! xo. Mom's authentic Puerto Rican Rice and Beans with savory homemade sofrito and sazon. You'll love this incredibly flavorful, comforting homemade meal that will fill your home with unbelievably delicious smells. The perfect recipe to serve a crowd or just savor leftovers for a few days! STEP 1: Soak the beans and bay leaf for 6-8 hours in 6-8 cups of water or broth; you want about 1 inch of liquid on top of the beans. I recommend soaking your beans for no more than 8 hours. You can soak at room temperature. STEP 2: After you soak the beans, bring beans to boil for 1-2 minutes, then reduce heat to low, cover and simmer gently for 1-2 hours or until beans are tender and soft. The last half hour that your beans are cooking you can begin to make your sofrito (see below), or once the beans are done cooking you can turn the heat off and allow the beans to sit while you cook your sofrito. It’s just up to your advancement level of cooking and preference. REMOVE THE BAY LEAF BUT DO NOT DRAIN THE BEANS. The liquid is essential to the recipe! STEP 3: How to make Sofrito (for 1 pound beans): Sofrito in spanish means sauce -- very traditional in many of the main staple foods in Puerto Rico: Add oil to a medium skillet and place over medium heat. Once oil is hot, add in onion, green pepper, cilantro and garlic. Saute until onions are translucent and green peppers soften, about 3-5 minutes. Bring heat to low and add tomato sauce, sazon and simmer for 2-3 minutes until sauce comes together. Add your sofrito to the beans (remember you were not supposed to drain the beans) and simmer uncovered over medium low heat for 20-30 minutes, stirring occasionally, so that the spices infuse with the beans. After that, turn the bean off and cover so that they keep the heat while you finish making everything else. They should stay hot enough for an hour or so. STEP 4: While the beans are simmering with sofrito, start making the rice: Add oil to a medium pot and place over medium heat. Once oil is hot, add in onion, green pepper, cilantro and garlic. Saute until onions are translucent and green peppers soften, about 3-5 minutes. Bring heat to medium-low and add tomato sauce, sazon and adobo and simmer for 2 minutes until sauce comes together. Next add in entire can of pigeon peas (with the liquid -- DO NOT DRAIN) and 3 cups water, and bring to a boil. Once it boils, stir in 2 cups of rice, cover, reduce heat to low and simmer 20 minutes or until rice is tender. STEP 5: Once beans and rice are done, taste both and adjust seasonings as necessary, including adding more salt. How to serve: add rice and beans to a bowl with extra sauce from the beans, garnish with cilantro and a few avocado slices. You can also add hot sauce if you like a little heat. Serves 6. If you want you can make homemade sazon! 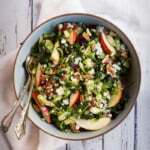 This is an excellent, flavorful option to have at home. 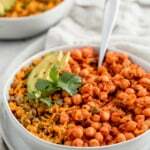 For this entire recipe you will need the following: 1/2 tablespoon ground coriander, 1/2 tablespoon ground cumin, 1/2 tablespoon ground annatto seeds (or sub turmeric), 1/2 tablespoon garlic powder and 1 1/2 teaspoons salt. Mix together everything in a small bowl. For the beans you'll need 1 tablespoon and for the rice you'll need 1 tablespoon of this DIY sazon spice mixture. If you do not have pigeon peas, which are traditional, you can use green peas instead. Simply increase the water in the recipe by ½ cup (so you’d have 3 ½ cups total). After you bring water to a boil you can add 1 ½ cups of frozen peas and the rice. 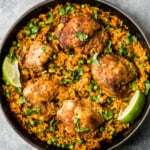 135 Responses to "Video: Mom’s Authentic Puerto Rican Rice and Beans"
This looks INSANELY delicious! So tasty and comforting, you’re so lucky that you had such great food as a child. Definitely going to try this one out! I am super lucky! It inspires so much of my cooking now 🙂 Hope you get the chance to try it! I CAN NOT wait to make this!!! Are we cooking the beans in the soaking liquid or draining and adding new water? I cannot WAIT to try these. I love a good bowl of beans & rice, and I love that these are authentic. Thanks for sharing, Monique (and mom)!! Oh my word this is AMAZING. Trying immediately. You can make the Sofrito the night before and freeze it. So when your ready to cook your Arroz con Gandules, the “rice & pigeon peas” the Sofrito has been frozen with flavor it will have a much better taste. The Sofrito and seasoning is what is important in this dish. So good luck ladies! Wepa!!! YUM! Yes, agree on that tip about freezing! So so good. That’s a great idea. Any tips on freezing leftover beans once cooked/prepared? Yes, you can simply allow them to cool to room temp after cooking, then place in freezer safe containers and freeze for later! Geez. I never had pinto beans growing up in Puerto Rico. It was habichuelas coloradas con arroz blanco, or garbanzo or frijoles negros (Ok, my mom was Costa Rican), or gandules. I associate pinto beans more with the Mexican cooking I came to love living in SoCal. Just my experiences. Sorry but this by no means is authentic Puerto Rican cooking. Nothing like my grandparents or my mom cooks. Well, it’s authentic for our family. I’m sure everyone is different. I’m a Puerto Rican, raised on the island (Ponce) and rice and beans is my favorite dish of all time and my death-row meal! My mom, grandmas, and aunts made this recipe with pinto or pink beans all the time, because we prefer them to the red ones. There are as many “habichuelas guisadas” recipes in PR as there are households, every cook puts their own twist on them. They all vary slightly, and they are all authentic and delicious (same goes for sofrito & arroz con gandules). Sazón packets are a staple there and you’d be hard pressed to find a kitchen in PR without them. Culantro leaves are hard to find in the US, but cilantro tastes so close, I don’t find the final taste of the dish is affected if you substitute one for the other. Anyways, I just wanted to say thanks for sharing a recipe so close to your family’s heart. It looks delish and I would happily dig in!! Doesn’t mean you have to rate the recipe low, you didn’t even try it. Jeez. Hi i am passionate PUERTO Rican cook and this does not take hours. Authentic in some ways but not totally. I was raised making the rice with both long,or short grain rice. We didn’t chop the cilantro we just threw a few stems with leaves and bam! Sofrito is better made in advance and can be frozen. I am a 69 yr. old Puerto Rican woman, both parents were born and raised in Puerto Rico. and this recipe is NOT authentic Puerto Rican beans. I don’t know about the arroz con gandules, I only got as far the picture of the beans and had to read that recipe. We use dark red kidney beans to start in this dish. I don’t think there is a naturally grown pinto bean in Puerto Rico. Pinto beans are a staple in Mexican cuisine. It may be that the original recipe was modified, and it may taste just fine. But, the texture is not the same at all. The beans should be in their own sauce, a pourable sauce Slightly thickened by 2 quartered potatoes cooked with the beans. Tomato paste, garlic smashed in a pilon, celantro, onion and green pepper. I am not familiar with the seasoning you mentioned in the packets. I’m not commentating on how your dish tastes, but it isn’t the same dish. Please don’t represent this recipe as an authentic Puerto Rican dish. Thank you. Hi Pauline — totally understand, but in America it’s nearly impossible to get celantro. This is what my Mom has always made us and so it’s authentic as it gets for me. Also, please note that I did mention that I personally prefer pinto beans. Have a great day! Ms. Ayala, I am Puerto Rican born and raised. There are many different kinds of beans that we buy in the island and that we make and made them Puerto Rican. In our home we had all kinds of beans, including the pinto beans. As a matter of fact, we never liked the kidney beans. 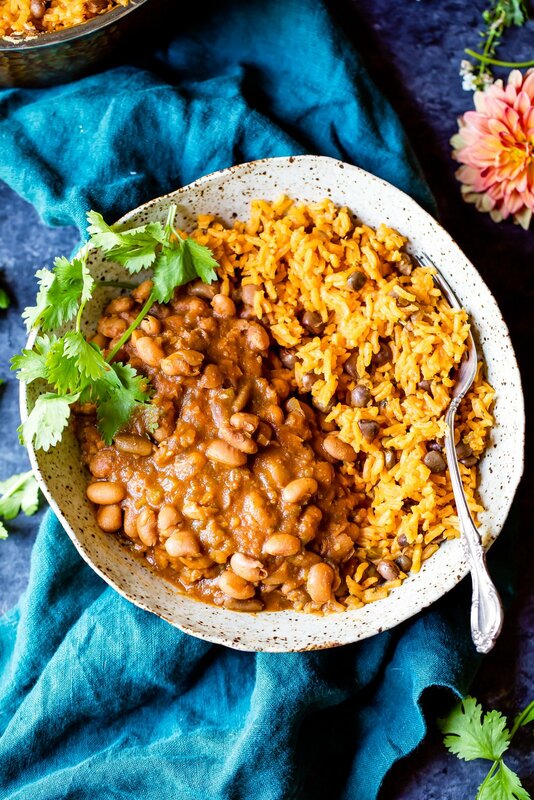 What I found interesting about this recipe is that she took the trouble to do arroz con gandules and then she added the beans. We either use one or the other, but we never mixed the gandules with beans. But that does not mean that is not Puerto Rican. Monique, thank you for reinforcing your heritage, we are all proud of where we come from or our parents come from. Good luck. Thank you for your vegan dishes. Thank you so much for your note. I’m proud of my heritage and of my mom’s delicious recipe! This looks like its packed full of flavor, excited to give it a try and hopefully make a large batch to enjoy for lunch throughout the week! Could the recipe work if you substitute with brown basmati rice vs. white? Looks delicious! Yep! Just be sure to soak the beans first, and add a bit less liquid. The flavors might not be as robust as they didn’t get a chance to bubble and steam, but it should turn out just fine! I buy Goya Pigeon Peas (gandules) at Target. Usually, you give nutritional infos for your recipes. You did not do it this time. It is important for me as I am diabetic and have to know these infos. But I understand! Made this today and it was SO tasty – a hit with my husband, too. We ate the beans and rice with baked chicken, but I’m excited to eat the leftovers with avocado. BTW- I tried to rate this 5 stars but couldn’t get the 5th to fill in. I agree with Wendy R. Please refrain from posting nasty comments. I look forward to trying the dish and as someone who had to eat British cooking as a child, I couldn’t care less whether it’s authentic. How would I know or care? Thanks. Thank you for your note, Shirley! Hi Adam! My family and I like to soak the beans and bay leaf for about 8 hours (which is where the timing comes from) – personal preference. I don’t think I’ve ever tried authentic Puerto Rican rice and beans! I know, SHAME SHAME SHAME. Definitely have to with this recipe! Yes! I hope you try it out! Recipe looks amazing, can’t wait to try it! Any idea how the beans freeze once they’re cooked? I often make big batches of black beans and lentils and freeze them in individual portions for future meals. They reheat beautifully. I’ve never frozen rice so I’m curious about that as well. You can freeze the Sofrito and the flavor will be great! I haven’t tried freezing the rice, but it should work just fine. Made this for “first day back to school dinner” and it was delicious. Definitely time consuming, but makes a large quantity and leftovers were even better. Some of my kids ate leftovers for breakfast. Another packed in her lunch. Yum! I just use the Goya Adobo All Purpose seasoning! Hi Carie! So glad you were all able to have some comfort during a scary time – I find that comfort food is one of the best ways to do so. Thinking of you down in Tampa Bay! How would you modify if you were using canned pinto beans? Thanks! Hi Jennine! I’ve actually never used canned pinto beans, so I’m not sure how the cooking time & flavors would vary! This is delicious! I found uncured turkey sausage/ kielbasa and sauteed that together with kale and diced jalapeno to add some meat and greens. I also misread the ingredients and grabbed yellow bell pepper instead of green. Either way, it turned out yummy and pleased this pregnant mama! Made my first Sofrito last night and I’m hooked. I’m an experienced cook, but have struggled cooking dried beans to my liking. This dish was the best version of rice and beans I’ve accomplished. Thanks so much for the new flavors and it will be a goto for our family. Amazing! I’m so glad you got to try it out 🙂 Such a great recipe to share with the whole family! I am making this recipe today, but with Adobo, because I don’t know what it is? I am in Australia. Would you please enlighten me? Hi Sue! Adobo is a seasoning, and is pretty much a mix of spices (salt, paprika, black pepper, onion powder, oregano, cumin, garlic powder, and chili powder). Try this one! And then just use a pinch of it in the recipe! I love the sound of this dish. I’m going to try it Mondy night! Thanks for sharing. Loved this recipe! I made the beans in my instant pot and they came out great! Followed all of your directions and I wouldn’t change a thing! Made this last night. It was wonderful! I am in the process of making it for tomorrow. I already made my first sofrito. It’s delicious. I will be soaking the beans overnight and putting it all together tomorrow. Will post a follow up. Brenda Diaz and Paulina Ayala …really…have to come onto this site and criticize recipe is not authentic…from Jersey City…good percent of my friends are from Puerto Rico…everyone has a different variation. In the end, I don’t see either of you sharing your “authentic” recipes. So easy to go onto another person’s page and put down…try your own site and see how you like it. Monique…thank you for sharing your family recipes. I did try this plus other recipes for same…loved it. Thank you for the kind words, Deborah! I’m so glad you’re enjoying the recipes here! This is probably a stupid question, but do you rinse the dried beans before soaking? Not sure if that would alter the soaking water like removing necessary starch or something. Thanks! Can I freeze these?? I want to make these but I’m afraid I can’t excatly eat them all in one go. It seems perfect for meal prepping! You can freeze the sofrito and the flavor will be great! I haven’t quite tried freezing the rice, but it should work just fine. Enjoy! Any suggestions for a veggie side dish that would complement these flavors? We try to have a green vegetable with every meal 🙂 Thank you! I would do some easy, roasted veggies like these! One of my all-time favorites! 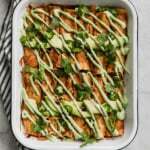 I found this recipe during my Vegan February, and now it is a staple in our household. Great for meal prepping, lunches or just a solid dinner. 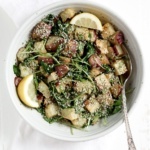 My ultimate meat eater friends devoured this, there is so much flavor – perfect for all crowds. Thank you! I’m so happy you found this one! I love meal-prepping this too 🙂 Glad it’s meat-eater approved! So, so good. We devoured every last bite. Thank you for sharing your special family recipe Monique! I have made this, and it it absolutely delicious!! I wondered if the beans could be made in the instant pot? I’m so glad you like it!! I think they should work in an Instant Pot, but I’m not 100% sure as I don’t have one. Probably a stupid question, but can I use canned beans and cook them in the liquid already in the can? Hi Britny! I haven’t tried it this way so I’m actually not sure – the way I cook the beans in the recipe will probably be your best bet! 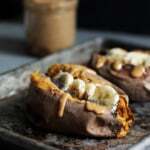 Hi – this recipe looks amazing and I am going to try it this week. How do you suggest preparing the beans using an Instant Pot pressure cooker? Cook the sofrito first, add to the dry beans & water, and cook everything under pressure for say 50 mins? Hi Colleen! I actually don’t have an Instant Pot, so I’m not sure about the cook time for this recipe. Sorry about that! I made this a few days ago and it is amazing! ALL the leftovers are gone and everyone is sad! I used my instant pot to cook the beans which was nice because I could skip the soaking and I cooked them on high pressure for 30 min (it made nice soft beans – you could set it for less time if you want firmer beans). After the beans were done I added the sofrito right to the beans in my instant put and set it on saute low to simmer while I made the rice and it came out great! This will be a new family favorite of ours. Thank you! So happy to hear that Taci!! This one makes delicious leftovers 🙂 I’m glad it’s a new family favorite! I made this last week and it was delicious! I am highly allergic to fresh garlic,so I just used garlic powder and a little garlic salt. The kids walked in and immediately were like, “Oh Mom! The house smells SO good! What IS that? This is now on my monthly rotation of dinner options! Thanks! Do you put in the rice uncooked or cooked and let it get more tender while it simmers? Um this was amazing!!! I did with kidney beans just because it’s my preference. I’ve always made this but with canned and buy the sofrito. Do to make it all from scratch was like whoa!!! Totally different and worth it! Extremely delicious!! Thank you! I will be making for my Puerto Rican family for Xmas! Thanks for sharing your version! Perfect! So glad you loved this one 🙂 Hope the whole family does too! I made this for my meal prep for lunches this week. I normally put salt pork in my rice, but this time i did without and it was delicious. I added a side of pork chili verde for more protein. Glad you liked this one! Perfect for meal prep (and adding your own sides 🙂 ). Monique this was absolutely delicious!!! My husband scarfed it down and in between bites requested that we have it every other week!!! 😀 All three of my boys loved it as well. Winner recipe! The ingredients really combined into something special. After soaking the beans overnight I cooked them in the slow cooker all day then finished on the stovetop. It was perfect! 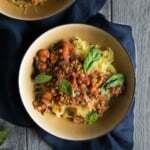 This is an amazing recipe and delicious meal. I cooked the beans yesterday, kept them in the pot in a cool place overnight and they heated up perfect when I made the rice the next day. It was indeed a learning curve…sazon…adobo and I enjoyed making them. So thank you for this ethnic PR dish. It warmed our Canadian spirit, in the middle of this current storm snap. And Happy Valentine’s DAY!! Perfect! So glad you loved this one. Great for winter!! Pretty good. My mother died before I could get her recipe. I know she made it a little different but this was delicious. I only made the beans. I had it over plain brown rice. I added potatoes to the beans. Who cares what beans you use? We probably make beans a little different in the US because some of the ingredients are hard to find. Anyway, thanks for the recipe. I made extra sofrito and froze it. Everyone’s authentic recipes are tweaked a bit differently 🙂 I’m glad you found this one and that you liked it! Great idea on freezing extra sofrito, too. In your defense I hate when people judge other peoples recipes. If it’s how your mom made it and called it, then that’s what it is. All you people wanting to correct her get over it. You cook and name your own version of Puerto Rican rice and beans. This sounds amazing and delicious. I can’t wait to try this version. As I also am Puerto Rican and of course my family had there own version but I love trying something new always. Thanks for posting this wonderful recipe!! Thank you so much! Yes, I named this one “Mom’s” Puerto Rican Rice and Beans for a reason 😉 Hope you love this version too! I just want to tell you how delicious this came out! I haven’t had real good Puerto Rican food since NY. I never attempted to make it myself because I know it wouldn’t taste anywhere near what my friends made. I don’t care what anyone says the rice is authentic! I don’t know about the beans cause I never had them. Both dishes are delicious! Takes me back to NY. Thanks again for such great recipes!